It took me a loooong time to hop on the green smoothie band wagon. For some reason I imagined that it would taste like a wilty salad all blended together. Not too appealing. Then along came Jim, who absolutely refused to eat his green vegetables. 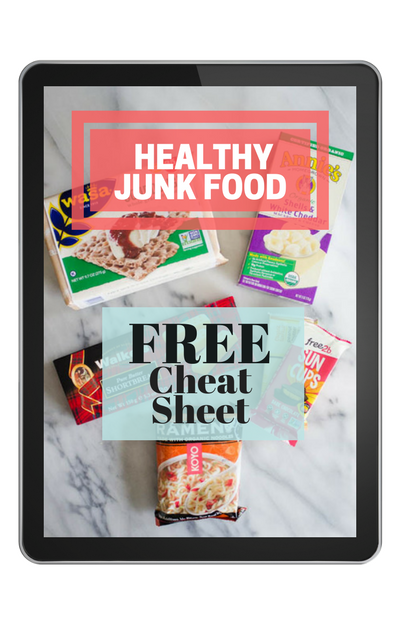 Not wanting him to miss out on all the nutrients from eating greens, I devised a way to incorporate them into some of the foods that he eats every day. 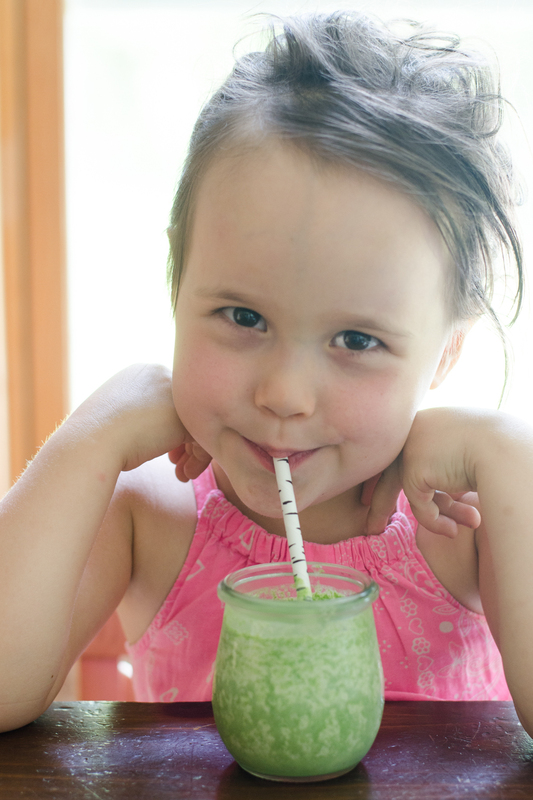 My kids adore smoothies, so it was a no-brainer to add some pureed greens. Helen was a bit taken aback with the color of the smoothie at first (not her usual pretty pink strawberry smoothie), but now she’s used to it. As I discussed in previous posts, it’s important to first cook your greens before consuming them. 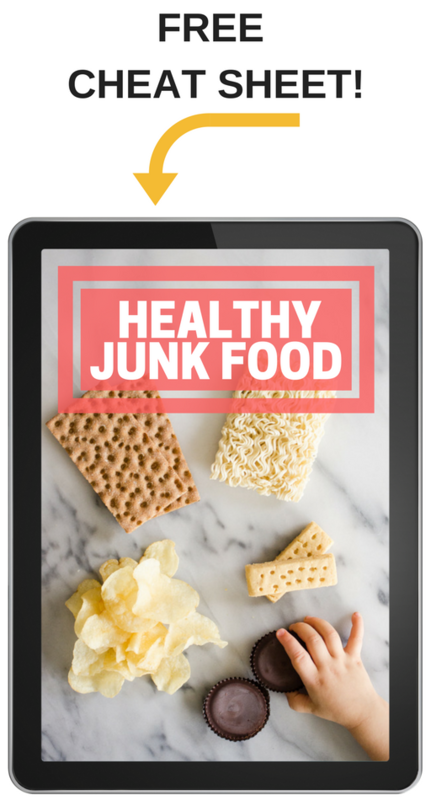 An occasional raw spinach or kale salad isn’t going to hurt you, but for something that you eat daily it’s a good idea to make sure it’s in an easily digestible/absorbable form. I outlined just how I prepare my greens for the week in my previous post if you’re interested. 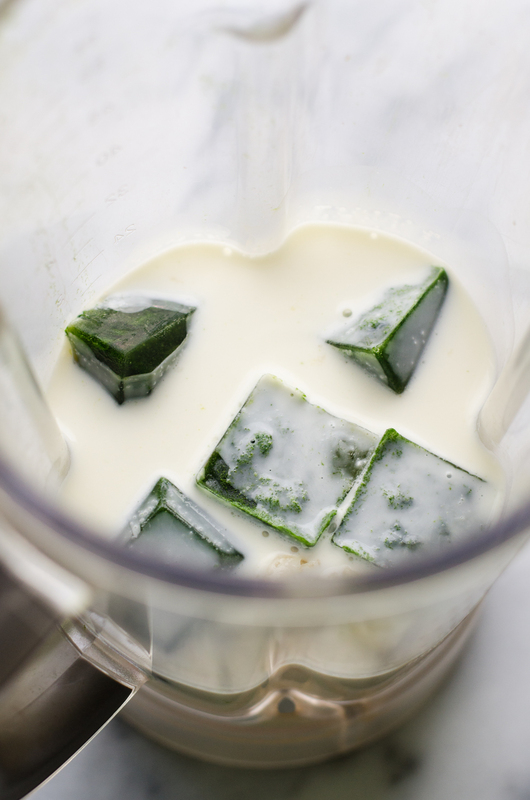 When I make a green smoothie with my prepped greens, I like to first freeze the puree in ice cube trays. Otherwise the smoothie can be pretty thin. Then I blend all the ingredients together and voila! 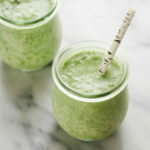 A creamy green smoothie that my kids love. Helen loved getting to drink her smoothie from my special little jars through a birch paper straw. That hair tho! James, my little stoic. This was the biggest smile I could coax out of him. 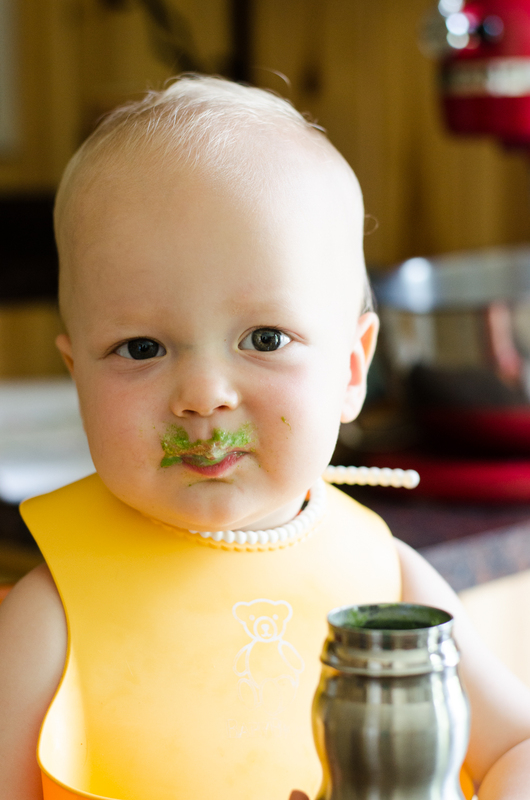 But he loves this banana green smoothie too. Sometimes I add a couple of spoonfuls of my pureed greens to my Strawberry Protein Smoothie. It isn’t a very appetizing color, but it’s delicious! I don’t like my smoothies very sweet. 1/3 of a banana is plenty for me! You might like yours sweeter – in that case just add more frozen banana. Your smoothie will be thicker as well. 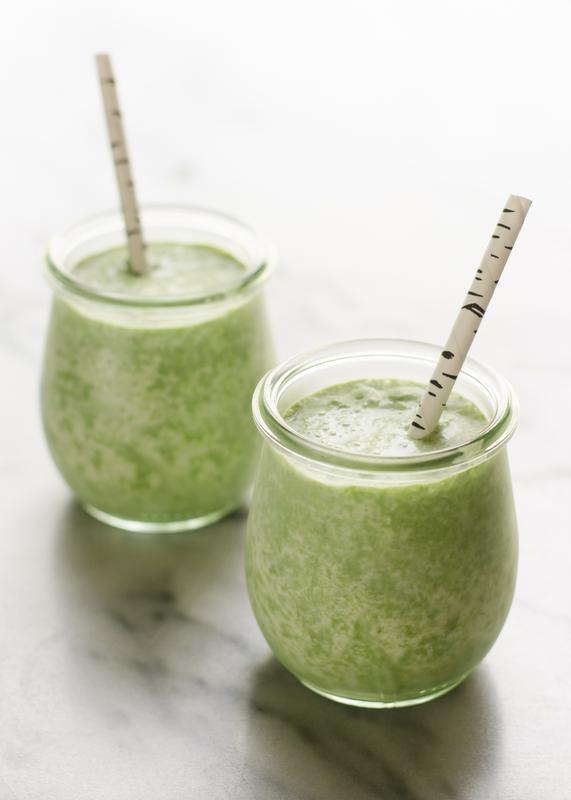 A healthy green smoothie that your kids will love! 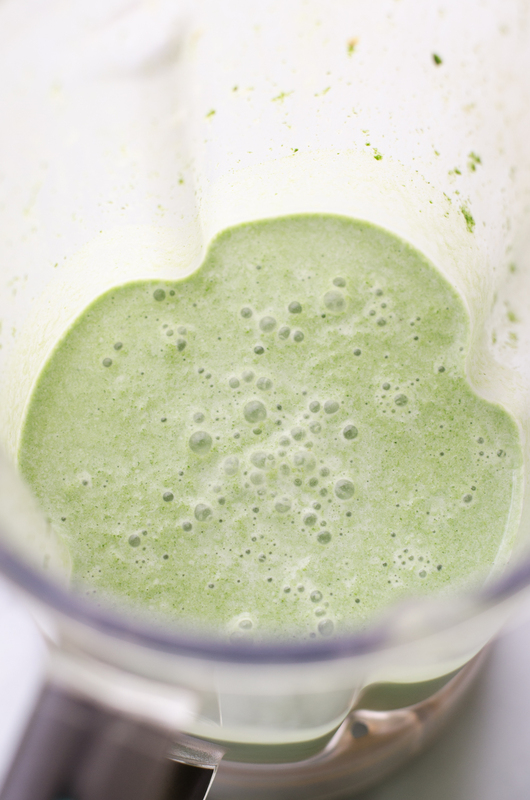 Place all ingredients in a blender and blend until completely smooth. Serve immediately. Instructions for cooking the greens HERE. THIS is the collagen I used. NOTE: Some links are affiliate. All opinions are my own (of course!). If you click on a link and make a purchase, I will earn a small commission. This has zero impact on the price you pay, and it helps to support Buttered Side Up. Thank you so much! 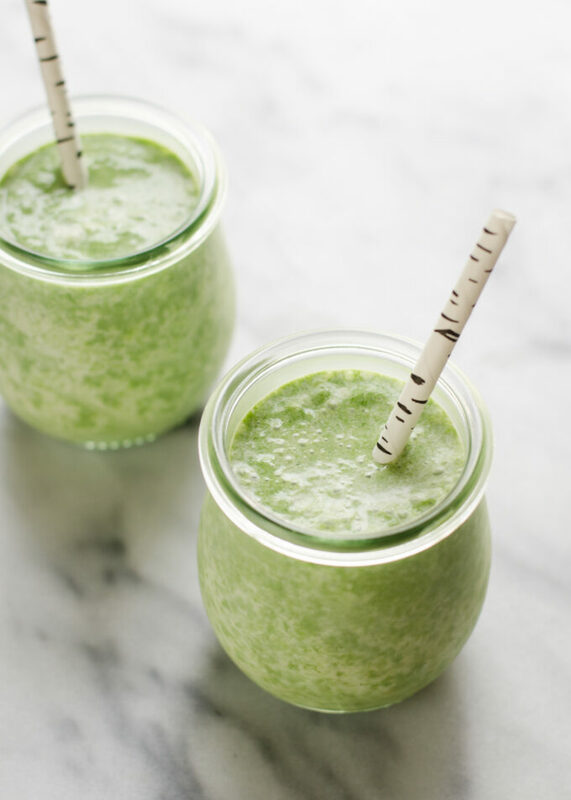 Love green smoothies! I put spinach in probably 93% of my smoothies because that's the only way to get my oldest to eat veggies. I am new to smoothies. 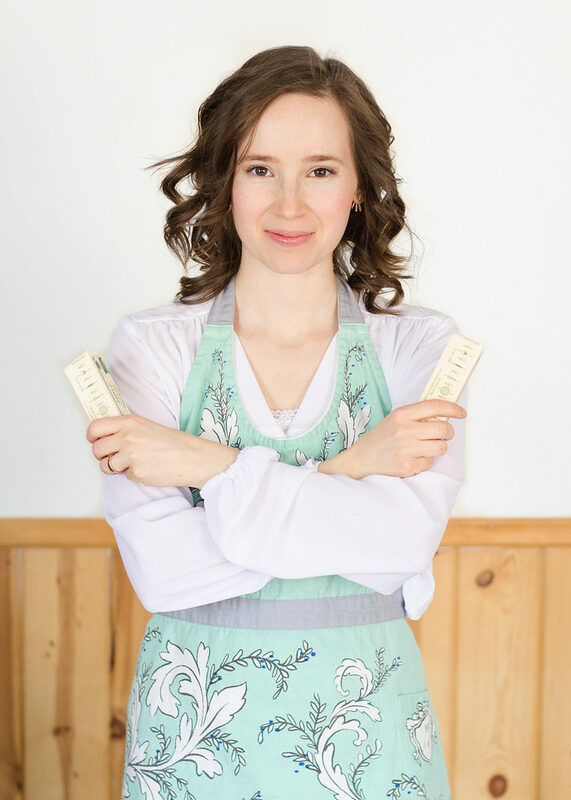 Why do you use the collagen? What is the benefit? Thanks! I love smoothies and I’m all for anything healthy and delicious. I’ll definitely try to make this at home. Can I put other green vegetables if I don’t have spinach available? Yep! You could use other greens, but I would suggest using mild-flavored ones. The picture alone looks very refreshing. I’m dying to try it, especially these coming moths.